Among the bigger hardware improvements over the XT is the inclusion of the new EF-S 18-55mm IS lens in the Canon XS kit. This light, compact image-stabilized lens can also be bought for about $200 on its own. In our testing over at SLRgear.com, this lens has really impressed over past versions of the standard Digital Rebel kit lens, with improved sharpness and reduced chromatic aberration. It's Canon's answer to the competing SLRs from Olympus, Pentax, Samsung, and Sony that use body-based, sensor-shift image stabilization, while Nikon and Canon use optical image stabilization. Like other Canon DSLRs with sub-frame sensors (currently, the Canon Rebel XSi, XTi, EOS-40D and 50D), the Canon Rebel XS will work with pretty much any EF-mount lens ever made, as well as with the special EF-S lenses designed for cameras with APS-C size sensors. Designed with a smaller image circle (the area covered by the image on the film/sensor plane), EF-S lenses tend to be smaller and lighter than full-frame models with the same focal length and maximum aperture. EF-S lenses can't be used on full-frame Canon cameras (nor on their models with 1.3x crop factors, like the current EOS-1D Mark III), but small-sensor cameras like the Rebel XS can use any full-frame lenses in Canon's arsenal. 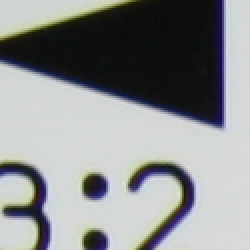 The sub-frame sensor on the Canon Rebel XS means that it has a smaller angle of view (by a factor of 1/1.6) than a full-frame camera with any given lens. 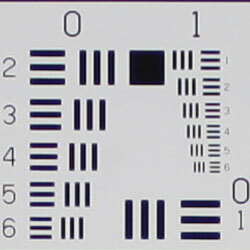 While most properly called a "crop factor," the 1.6x ratio is most commonly referred to as the "focal length multiplier" since that's how it works in practice: Any lens used on the Rebel XS will have the same field of view as one with a 1.6x greater focal length would when attached to a 35mm camera. (For example, a 100mm lens on the XS will show the same field of view as a 160mm lens on a camera with a 35mm frame size.) This means that the 18-55mm kit lens for the XS has a coverage roughly equivalent to that of a 29-88mm lens on a 35mm camera. The "IS" in the kit lens's name stands for "Image Stabilization." This is a handy and increasingly common feature of both lenses and some camera bodies. 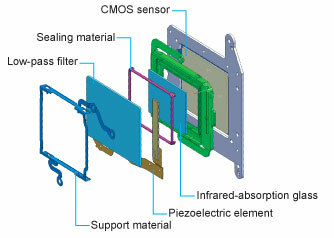 The idea is that a motion sensor, computer chip, and movable optical element are built into the lens barrel. 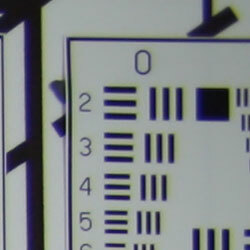 The motion sensor detects motion that could lead to blurred images with long exposure times. 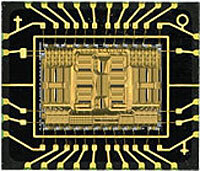 This data is processed by the computer chip, which in turn moves the floating optical element in such a way as to counteract the motion of the lens, thereby keeping the image stationary on the camera's image sensor. The net result is that you can shoot at much slower shutter speeds than you'd otherwise be able to, without getting blurred images as a result. Image stabilization technology generally works very well, and Canon has been making IS equipment longer than most competing manufacturers. The net result is that the new IS-enabled kit lens does a great job of delivering sharp photos under dim lighting: In the case of the 18-55mm f/3.5-5.6 IS lens, you should be able to shoot at shutter speeds up to 16x (4 stops) slower than you can normally hand-hold without IS. As mentioned above, some manufacturers have begun building Image Stabilization capability into their camera bodies, rather than their lenses. The advantage of this is obvious: Every lens you put on a camera with body-based stabilization becomes an IS lens. A body-based IS system makes for a much less expensive lens collection, since you don't have to pay for IS technology in every lens you buy. There are two downsides to body-based IS, though. First, we've found that the best lens-based IS systems outperform the best body-based IS systems by a factor of two or more (one f-stop). Second, the body-based systems don't stabilize the image seen in the viewfinder, unless you're using a Live View camera that captures its viewfinder image from the camera's main sensor. In extreme cases, having a stabilized view through the viewfinder can be a great aid to accurate framing and improving your own stability for sharper pictures. So neither IS technology (lens-based or body-based) wins over the other on all points. If you plan on assembling a large collection of lenses, body-based IS will save you money, but at some cost in performance, and without the benefit of a stabilized view through the viewfinder. Lens-based IS can work better (not all IS systems are created equal), but will cost you more if you end up buying a lot of lenses. For the casual user who doesn't plan on acquiring a large lens collection, either approach will work, now that IS-enabled kit lenses are appearing as part of consumer-level SLR bundles. Manual focus is also available with any of the Canon EF and EF-S lenses, simply by sliding the AF/MF switch on the lens barrel. In Live View mode, the XS offers both phase-detect autofocus ("Quick mode") using the dedicated AF?sensor, or contrast-detect autofocus ("Live mode"), using the image sensor. Quick mode is faster, but interrupts the display briefly while the mirror drops, focus is performed and flips up again. There is no interruption in Live mode, but focusing is much slower. Manual focus with 5x or 10x magnified view is also supported in Live View mode. The Rebel XS digital SLR camera includes Canon's EOS Integrated Cleaning System, first introduced on the EOS Rebel XTi camera. 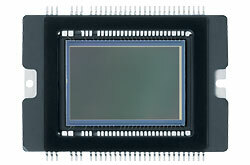 The camera's Self-Cleaning Sensor Unit shakes dust particles off of the low-pass filter in front of the sensor. The dust is then trapped by an adhesive along the base, preventing it from causing further nuisance. Cleaning is engaged each time the camera is powered up or shut down, or manually through the "clean now" function. The second part of the cleaning system involves post-processing with a compatible personal computer and the supplied Digital Photo Professional software. Here (via a menu option) the camera maps any spots that may remain on the sensor, saving it as Dust Delete Data and subsequently subtracting dust spots from the final image during post processing. A third option includes a manual sensor cleaning function which raises the mirror and allows users to clean dust that may have stuck to the low-pass filter. Despite the dust cleaning features, we haven't seen an automatic system capable of removing all dust. So while this is a nice feature to have, don't be fooled into thinking that you won't have to either learn how to clean your sensor or send it in for cleaning. Everyone understands that lenses sometimes get dust on them and need to be cleaned, and there are a lot of lens-cleaning cloths, solutions and other accessories on the market that work well. But what do you do when your sensor gets dusty? Dust specks on the sensor tend to show up when shooting at very small apertures, appearing as dark blobs on your images. They're distracting at best, a terrible nuisance at worst, if you end up having to retouch every image to be rid of them. Most of us are naturally leery of the idea of poking around inside the delicate innards of our DSLRs to wrestle with recalcitrant dust specks. Gently blowing the sensor surface (actually, the surface of the anti-aliasing filter) with compressed air gets rid of some dust, but there's invariably a lot that just stays stuck, no matter what. So what do you do? If you've got dust specks on your sensor (and sooner or later you will), you're going to need to clean it. There are a lot of products out there intended to address this need, but a distressing number of them work poorly (if at all), and many are grossly overpriced. Advertising hype is rampant, with bogus pseudo-scientific jargon and absurd product claims. And prices -- Did we mention prices? How about $100 for a simple synthetic-bristle brush? So how do you know which product to use? We don't pretend to have used everything currently on the market, we but can tell you about one solution that works very well for us. The "Copper Hill" cleaning method is straightforward and safe, and in our routine usage here at Imaging Resource, very effective. Better yet, the products sold by Copper Hill Imaging are very reasonably priced. Best of all, Nicholas R (proprietor of Copper Hill) has put together an amazingly detailed tutorial on sensor cleaning, free for all. Sensor cleaning is one of the last things people think about when buying a DSLR, but it's vital to capturing the best possible images. Take our advice and order a cleaning kit from Copper Hill right along with your DSLR, so you'll have it close at hand when you need it: You'll be glad you did! Very good performance with the 18-55mm IS (Image Stabilized) kit lens. The Canon Rebel XS comes with an 18-55mm IS kit lens, which is a fairly average optical zoom range of ~3x for a kit lens. Details are reasonably sharp, with a hint of softness across the frame at maximum wide-angle, with relatively low levels of coma distortion but some noticeable chromatic aberration in the extreme corners. Results at full telephoto are even better, with good sharpness across the frame and very low levels of chromatic aberration. All in all, it does really well for a kit lens, and the added image stabilization will come in handy for low-light shooting. A small area (for an SLR kit lens), with excellent detail. Flash throttles down well. As with zoom performance, the Canon XS's macro performance will depend entirely on the lens in use. However, with the 18-55mm IS kit lens set to 55mm, the XS captured a small (for a non-macro SLR lens) minimum area measuring 2.47 x 1.65 inches (63 x 42 millimeters). Resolution and detail were high, if a little soft, with some softening in the corners from the lens. 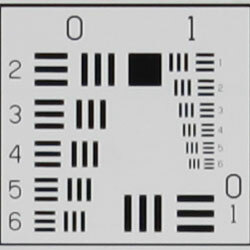 (Most lenses have some softening in the corners at macro distances.) The Canon XS's flash throttled down for the macro area pretty well, and there was no detectable shadow from the lens barrel, resulting in a good exposure with the flash. Moderate barrel distortion with the 18-55mm IS kit lens, though low pincushion. The Canon XS's 18-55mm IS kit lens produced about 0.9 percent barrel distortion at wide-angle, which is slightly higher than average among the cameras we've tested, and noticeable in its images. At the telephoto end, the less than 0.1 percent pincushion distortion is quite low and not nearly as noticeable. This is the tendency for the lens to bend straight lines outward (like a barrel -- usually at wide-angle) or inward (like a pincushion -- usually at telephoto). Moderate and bright at wide-angle, but lower at telephoto with the 18-55mm IS kit lens. 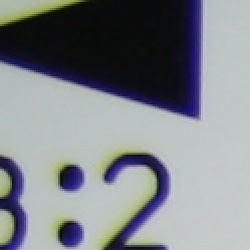 Minimal blurring in the corners of the frame at both zoom settings with the kit lens. corners (upper right). Wide: Sharper at center. corners (upper right). Tele: Sharper at center. The Canon XS's 18-55mm IS kit lens produced only slightly soft corners in a few shots. At wide angle, corners on our test targets had very little softness compared to the center. At telephoto, corners showed about the same amount of softness, which is much less than average for a kit lens. A very good performance here, especially considering these shots were taken at maximum aperture (corner softness usually improves when the lens is stopped-down a few f-stops). Impressive results here. 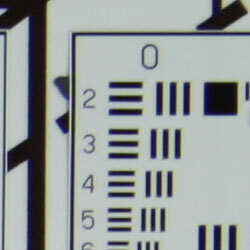 The images above were taken from our standardized test shots. 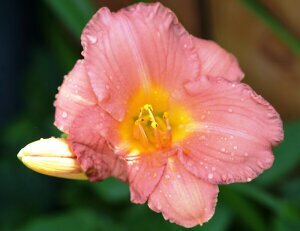 For a collection of more pictorial photos, see our Canon EOS XS (Rebel XS, Canon 1000D) Photo Gallery .